In 2014, I stepped up to lead a dying filmmaking Meetup group in Nashville — the Nashville Filmmakers — which is now a thriving community of artists making films. Little did I know, that with an open-mind, some hard work, and a positive attitude, our community would double in size, spawn six filmmaking teams, gain valuable sponsorships, build lasting friendships, and foster the kind of film culture I dreamed about being a part of in Nashville. It is amazing to realize that the very community you desire is waiting for you to make the first move. I want to share my experience as one way you could approach building a community around your art. Meetup.com is unique in that it can act as a digital community but mostly focuses on the real world of people hanging out with people face-to-face. This is key because building both sides of your community will reap the greatest benefits. You can use many tools to build a community online and offline, but Meetup does a great job as the singular tool. To give you an idea that it’s working, look at this chart from Meetup.com. 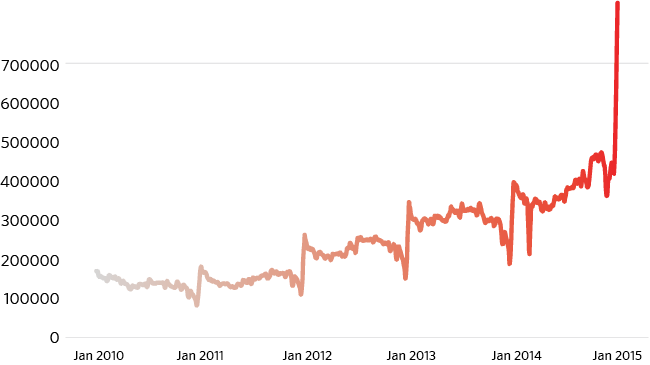 It shows the number of people joining meetups through January 2015. You could use email lists, Twitter, Facebook, Instagram, Google, and any number of different tools to create your culture and communicate but Meetup does everything you need to get started. My chosen theme was filmmaking, since I could never really give up my love of music to take photos, or my love of writing to design, etc. Film incorporates all the art forms I love together into one cohesive master form. And after being in Nashville for the requisite number of years, I still had not found the creative community I desired. Most likely because I felt out of place just taking photos or just making music. Filmmaking lends itself naturally to a community of art. There are few art forms that do not because all art has a creator and a partaker. You may already know your art form, media, or theme. Your next step then is to get on Meetup.com and find every meetup in your area around a theme you love. Pull them all up and start noticing several things. Which ones are actively meeting? Who leads them? Are they free or paid? Is there a clear purpose or vision of the group? If there is one that doesn’t seem like it is going anywhere that has a solid membership, your job is to either inquire about taking over leadership of the group, or wait for the current leader to step down. In a rare case, you may choose to start one from scratch, but I recommend trying to take an existing community to new heights, as this worked well for me. When I launched my first Meetup in January, over 60 folks showed up out of the 300 or so members in the group. I was pleasantly surprised. But the work that had gone into the planning up to that point was important. Should I put everyone in a speaker/audience setup, or a circle? Should I segment out blocks of time to talk about different things, or be more open with where the members wanted to take it? Where should we meet? Should we have food? All of these decisions hinge on what you as the leader want to focus on in your group. I chose friendship, fun, and getting films done. My wife is a talented artist and life coach for teen girls, so naturally, I asked her the best way she knows to foster community quickly. She said to arrange the seats in a circle and make sure to give everyone an equal voice to share. It worked brilliantly and became a cornerstone of our group. The introverts who were brave enough to come out now had to be brave enough to share with the group. And they did. And they made some new friends. And it was awesome. 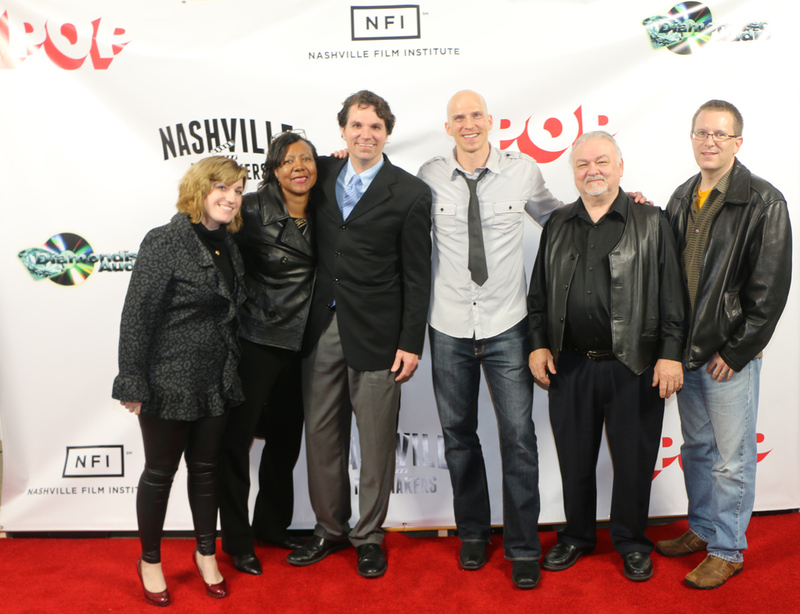 Little did I know, another filmmaking group had launched that month as well, the Nashville Filmmakers Guild. They chose to focus on education and industry networking in a speaker/audience format. I joined that group as well and supported it fully. Every community is unique. There is room for all of them. And there is a desperate need for yours. To ensure your group stays true to your purpose and provides a replicable high-quality event, you must choose certain parameters that stay consistent. In my group, I did several things right from the start that made a difference. I decided to meet once per month for two hours on Sunday night. I scheduled one meetup at a time and focused all my marketing efforts on the next one. I emailed my entire group every week with updates on the group, industry news, Nashville events, and helpful tips and tutorials. I curated all group requests and announcements through that weekly communication. This connected the group often enough to built momentum toward attending the real-world meetup. I gave each meetup a unique name with the month in it, such as the April Axis. I decided not to provide food. I chose a key discussion question each week. We started each Meetup by introducing ourselves, our unique art, and then answering the question. The meetup would then wrap-up and spin into natural conversations that were sparked by all the unique voices sharing their hearts. I charged annual membership dues. I opened the meetup to the members to launch sub-meetups of their own around their films or projects, such as audition calls or screenings. Every popular song has a hook, and every meetup should have a leader with a vision. What big idea are you leading your group to accomplish together? Paint the picture for them. Every week. Talk about it in your emails, in your meetups, in your conversations. You will find this creates excitement, movement, and action. All things a group needs to grow. My vision was to finish at least one short film by the end of the year. And then premiere it in December. We saw six active filmmaking teams created to achieve that goal. And three made it to the finish line. At that point in time to my knowledge, in January 2014, no other filmmaking meetup group in the country had successfully accomplished this goal. Many came very close, but none could organize well enough to achieve it. Some got stuck forming non-profits or businesses. Some got stuck trying to pay everyone. All good things, but missing the point of the group. What is your vision of where you want to take your group? What does success look like, feel like? When will everyone know you have achieved it? In my case, planning and promoting a big Red Carpet Premiere event in December was the perfect end to realize the vision, have fun, and celebrate all the hard work that we all had put into our films that year. I encourage you to plan at least one special event during the year that goes above and beyond the normal meetup. There should always be a reason to throw a party, and it will bring everyone closer together. Our event went off without a hitch, except one. I went a little too ambitious by trying to live stream it to the Web for all those out of state or not able to come. Our technical limitations collided with the reality of trying to both stream online and screen the films from the same computer. We ended up releasing an edit after the event, but to all who were there, it was an amazing experience. The excitement, fun, and family atmosphere made the night magical. We dressed up, we ate and gave toasts, we watched our films, and we celebrated art and community. As part of your initial planning and vision casting, include a special event that no one is expecting. Calculate your costs and include them in the dues. You will not regret it. By the time the Red Carpet Premiere had come, I was exhausted from leading by myself all year. It was time to expand the leadership team beyond myself and pass the torch of leadership on to a worthy member who showed initiative, desire, involvement, and leadership skills all year. I had a newborn coming any day that December, and it was never my intention to lead forever. As I shared at the Premiere, sometimes you must say no to the good, so you can say yes to the great. As a leader, you must understand that leadership is a privilege and not a right. It is a responsibility and a burden you carry for your members. It is a service. And to step down to let others lead, to develop and replicate yourself, will only serve to strengthen your meetup and group. I urge you to consider this from the start in your planning. Keep your eye out for those who are future leaders that show potential. As I passed the mic to Mitch Emoff that night, I smiled at the thought that platforms are not something you own. Communities are somewhere to belong. And whether you are the organizer, leader, or member, you have a part to play. Be OK with giving your community back to the members in better shape than you found it. So it can grow and thrive long after you are gone. Following my path to build a community of art may not be the best option for you, but if you are having a tough time building your mailing list, facebook group, or platform in general, maybe it’s time to take it off-line and to a Meetup format. My film, Phase 6, was one of the six short films that did not get completed in time for the Premiere, but only because of my ambition. Of course, in addition to leading the group, I had to choose a sci-fi with special effects, a custom score, and over 10 locations and 10 actors. And it had to fit inside 10 minutes. It is still in post-production, and I cannot wait to start sharing about it soon. Join my mailing list to keep up with my progress on it. Have you tried to build your own Meetup?